Another World was a big, big success for Delphine, receiving critical acclaim and selling thousands of copies across every format it was released for. It’s no surprise that their next game was a sort of semi-sequel1, but despite its superficially similar appearance and gameplay Flashback is a very different beast indeed. Where Another World was largely the work of a single man – Eric Chahi – Flashback had the resources of the entire company behind it. This more conventional approach led to more conventional gameplay; Flashback is more directly recognisable as a platform/puzzle game than the genre-straddling Another World, relying on a discrete plot told through narrated cutscenes rather than the silent cinema approach of its predecessor. Set a couple of centuries in the future, Flashback’s player character is the excellently-named Conrad B. Hart, an amnesiac kidnappee who escapes from the facility where he is being held prisoner in the game’s thrilling rotoscoped intro. Waking up in an unknown jungle environment, he has to figure out where he is, who he is and why there’s a large group of shadowy conspirators who want to silence him permanently. This use of amnesia as a plot device to drop a player into the middle of the action with no explanation is hardly original as far as videogame stories go, but I think Flashback can be forgiven for two reasons. First, it’s arguably the game that started the amnesia trope in the first place; while my knowledge of games pre-1990 is not what it should be I’m certainly struggling to think of one that got to the concept before Flashback did. Second is that while subsequent games used their amnesia as a convenience to avoid the hassle of explaining to the player what was going on, Flashback wholly embraces the idea and builds the entire game around it. It’s in the name, for crying out loud2; Conrad spends the entire first third of the game trying to recover his lost memories and the last half of it attempting to foil the people who erased it in the first place. Not until Planescape was there a game that made more effective use of an amnesiac player character, and Flashback’s otherwise pedestrian storyline is rendered far more memorable than it otherwise should be by its willingness to experiment a little. Flashback’s gameplay is heavily influenced by Prince of Persia (to the extent that Jordan Mechner thought Delphine was ripping off his rotoscoping technique in the friendliest possible way) and has far more classical platforming elements than Another World. 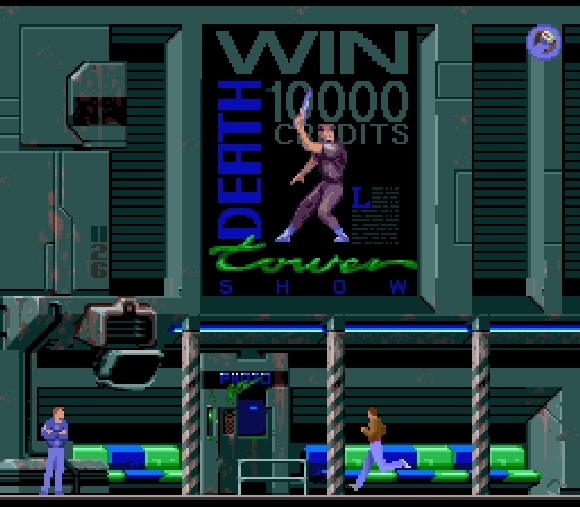 Dressed in a very 90s outfit of blue jeans, white sneakers and brown jacket, Conrad runs, jumps and rolls around the game’s levels in a manner heavily reminiscent of the Prince, even hanging from ledges in a near identical way. There are no spikes, loose tiles or steel guillotine traps, of course, but Flashback’s levels are instead populated with a collection of appropriately high-tech environmental hazards, not to mention enemies ranging from heavily armed mutants to killer cyborgs. All Conrad has to combat these nasties is a gun with unlimited ammunition3 which has an excellent firing animation with a very meaty sound, but which is rapidly revealed to be the 23rd century equivalent of a peashooter as your enemies repeatedly stagger to their feet after receiving a volley of hot lead. Subsequently combat in Flashback can be a rather frustrating business at times, even though Delphine attempted to soften the difficulty a little bit by providing Conrad with a shield that can absorb three hits before failing, but fortunately combat is never the real focus of the game. Instead you spend most of your time trying to solve a collection of fiendish puzzles, and here I have to say Flashback surpasses the maddeningly opaque challenges of Another World. 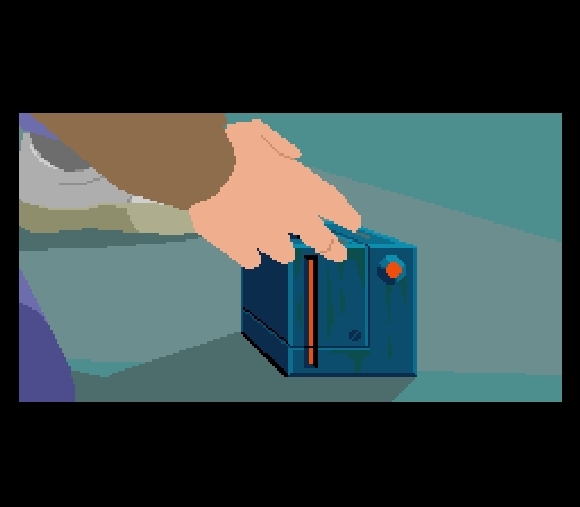 Flashback steals the adventure game structure of giving the player an overarching narrative objective for the level – obtain an anti-gravity belt, get enough money for a set of papers etc. – and then presenting the player with a series of puzzles which block progress on that objective until they’re successfully solved. By and large it works exceedingly well in keeping the player focused and involved – certainly far more so than other contemporary games such as Prince of Persia, which gave you a broad end goal and expected you to complete the entire game off the back of that. Flashback weaves narrative with gameplay to constantly refresh the player’s goals and give them a sense of progression as successive puzzles are overcome to advance the plot, and it’s one of the first action games to really do this successfully. It certainly wouldn’t function anywhere near as well as it does as a game without the gradual drip-drip rewards of new revelations driving your exploration and problem-solving. Flashback’s visual design is outstanding. 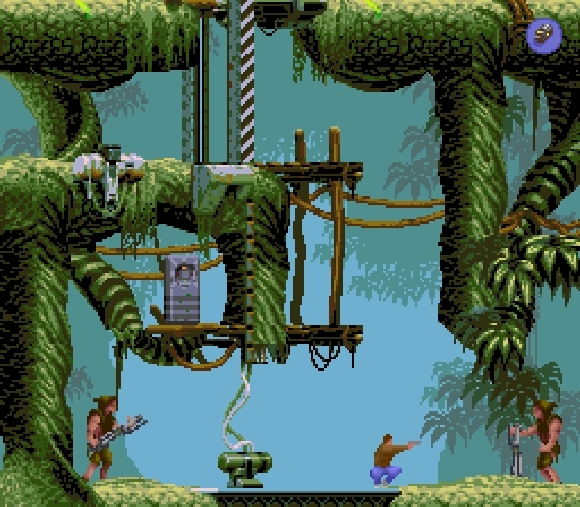 At the time it was one of the best-looking games around – although it has aged more poorly than Another World thanks to its insistence on lifelike animations and art instead of a more stylised approach. 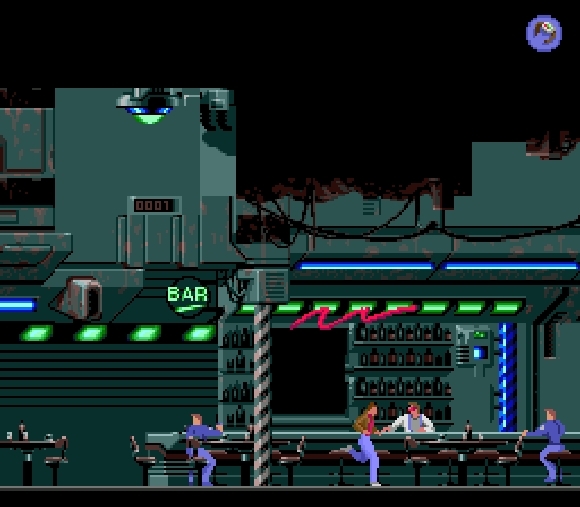 The first environment – the jungle – is a little underwhelming (although undeniably a very effective location to set the first, most confusing portion of the game) but Flashback soon transitions to the seedy, cyberpunk-y underworld of Titan and its dystopian Death Tower sequence which takes obvious inspiration from Arnie flick The Running Man, and while the rest of the game never quite matches that initial high point it’s never less than brain-searingly memorable in terms of appearance and aesthetics. It was the first game I played that ever tried to portray that high tech yet slightly depressing vision of the near future I subsequently found so compelling in the Deus Ex series; this is something that’s stuck with me for the last twenty years and will probably stick me with me until the day I die. Flashback is the reason I like cyberpunk so much, and it’s largely down to the way it looks and feels. Feels. I think that’s the crucial word here. Flashback is far from a perfect game. Once you get past the amnesia thing its plot is startlingly pedestrian and some of its puzzles are terrifyingly obtuse. However, it feels like its more than the sum of its parts, and does far more to project an appropriate sense of atmosphere than most modern 3D wunderkinds running on technology that was unimaginable when Flashback was around. It takes a slower, more thoughtful approach to adventure that’s missing in its older sibling, Another World; in that game the constant threat of death meant you were constantly driven onward and never stuck around to sightsee, but Flashback lets you off the leash to explore. That’s the entire point of a game which builds itself around a central mystery and then sets you to solving it, for all that the eventual resolution was cornier than an episode of Battlestar Galactica4. You spend far more time thinking than you do shooting and violence is comparatively rare, and (when it happens) brief. That’s an admirable stance for a game to take, and an increasingly uncommon one nowadays as demonstrated by the remake; the last time I saw a game miss the point that hard we got… well, we got Syndicate, is what we got5, and look how well that turned out. Personally I think I’ll stick with the original; I played through it again a few years back and while it hasn’t aged particularly well it still retains much of its charm. Few games as old as Flashback do. I think that, if nothing else, is a true sign that it’s a classic. This game cannot be praised enough. Everything that was cool about 80′s style Sci Fi in one of the most fun and atmospheric games I’ve ever played. I know you like to play devils advocate and balance your praise with a little fair criticism and that seems like a good way to go about it, but for me this game will always be perfect. Just a perfect game even by my standards today. You’re spot on about the Death Tower being at the pinnacle of the game.. I would like to call attention though, to the entire sequence before it when you’re roaming the city installation taking on jobs for credits. That whole part was just so cool. You mention the great sound of the gun and you are so right about that. That echo that it makes.. I will never forget that sound. incredible. No praise for the soundtrack though? I don’t know if there is a difference in music between versions like in Another World, but man did the SNES version have incredible music. I really like the menu music and the piece that plays when you’re reading the diary of the scientist trapped on the alien homeworld, but — as ever — different platforms had different arrangements, and the SNES music may well sound completely different to the Amiga/Acorn versions. The bit where you’re doing the odd jobs is fantastic, even if it is just a thinly disguised way of making you do some random puzzles before entering Death Tower. I’m a big fan of contextualising game activities like that, and Flashback is probably the game responsible for me liking it so much. I’m the only one who commented on this huh? 20 years later and still no one appreciates what a great game this is. Shameful.